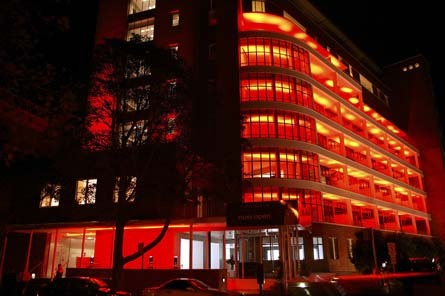 CLS recently painted the St Margaret's building in Surry Hills, Sydney a striking colour red. The main objective was to light ex-hospital building in spectacular fashion for the launch of St Margaret's new Apartment Project. The exterior was lit in brilliant red whilst the internal stair well was highlighted with Green Laser Beams.